ICOS attended the 23rd Economic Board Meeting of the European Milk Market Observatory held on 26th September in Brussels. ICOS attended as part of the Copa Cogeca delegation. Others represented included Eucolait (dairy traders), the European Dairy Association, Eurocommerce (retailers) and CEJA (EU young farmers). Eucolait confirmed that global milk output is increasing on the back of higher prices and further growth is expected into the second half of 2017 in all major export regions. 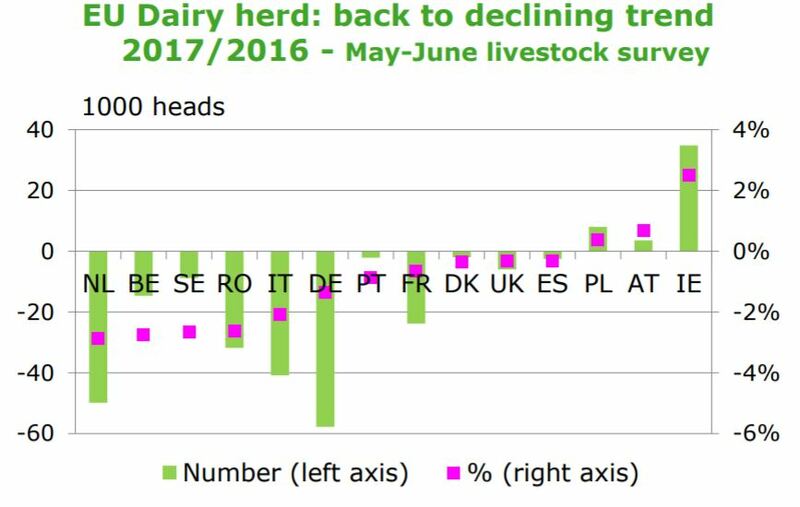 EU milk deliveries contracted by 0.3% from January to July but increased by 220,000 t in July. A production drop in July in France, Denmark and Germany has been offset by increases in Ireland, Italy, Poland and the UK. German weekly deliveries in September are now above 2016 levels. Combined world milk output increased by 0.17% from January to July. Global growth is driven by the US (+2% in August) and prospects point to further expansion in Oceania for the new season. Strong demand in China and South East Asia in H2 2017 will help absorb some of the increasing volumes, while demand in MENA countries is subdued. EU exports have performed well (especially cheese and SMP) but are getting increasingly difficult due to a stronger euro and weaker dollar and competition from the US and New Zealand. The EU is currently the most expensive origin for all commodities. The fat to protein price gap is larger than ever (4:1), historically (1.5:1). The butter price elasticity has been stretched to the maximum but demand is expected to remain positive in the longer term. Despite record SMP exports so far, prices have fallen below the intervention level again. The absence of a safety net as intervention closed on 30th September will put even more weight on EU exports in the months to come. Finally, cheese remains the most stable market segment. The European Commission is projecting a 0.7% increase in EU milk collection in 2017, with a further +1% for 2018. The Commission provided information on the status of the EU dairy herd, which contracted this year especially in the Netherlands and Germany. The dairy herds in Ireland, Austria and Poland expanded. Finally, the meeting was provided information on the production of Fat Filled Milk Powder (FFMP) in the EU, with 450,000 t produced in the EU annually mostly for export to Sub Saharan Africa. Approximately 2/3 of total FFMP imports into Sub Saharan Africa are from EU. FFMP imports grew by +17% per annum from 2007-11 with estimates suggesting +5.5% growth from 2016-2021.